Without fail, when school starts after Labor Day something shifts in the air every year. I can feel it. Waking up to crisp cool mornings that warrant a sweatshirt instead of a tank top is just the first of many signs. I can see it. Suddenly leaves everywhere are showing the beginning signs of changing colors. Bright yellowish green and orange leaves start to sway back and forth alone in the wind as they meet their fate on sidewalks and streets. I can taste it. It is time to give in to my first pumpkin spice latte of the season. Man, those pumpkin spice lattes are good! And from that moment forward I don’t look back. Good-bye swimsuit (not that I liked you that much anyway) and hello jeans and leather boots! Hello, rain jackets and long sweaters! It’s as if no time has passed at all and being reunited feels so good! Today is the first official day of fall and with fall comes its benefits, starting with comfort food. Last night I made bacon mac and cheese topped with sautéed mushrooms and fresh chopped chives because it seemed like the right thing to do. From warm oatmeal for breakfast in the morning to something wonderfully delicious in the evening, I’m embracing fall with open arms, my favorite oversized sweatshirt, and my trusted 15 year old slow-cooker. Figuring out what to make and eat for dinner stresses me out. Most days I’m fine with it but sometimes I go through spells where all three of my kids have somewhere to be after school; trying to figure it out is exhausting. Part of the whole ‘figuring it out’ thing involves trying to cook different types of meals – not for the family’s sake but for my sake! Sometimes I wish I was one of those people who could eat tacos every Tuesday and have a designated meal for each day of the week. I’m one of those people who like variety and will mix things up for the sake of my taste buds. Ninety-eight percent of the time trying new flavor profiles works pretty well, but for the remaining two percent I simple concede and pick up take-out pizza… with no complaints from anyone. Today, I have a great beef stew recipe for you. It’s not your ordinary type of beef stew recipe. Instead, this one comes with a delicious twist. 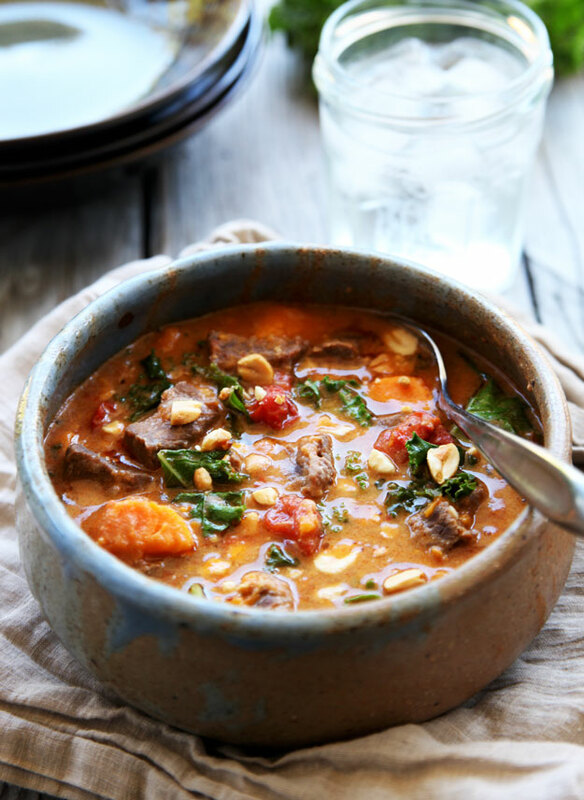 This Beef Peanut Stew recipe is inspired by traditional beef stew, African and Asian cuisines, and most of all my inquisitive curiosity to pair different flavors together. Best of all it’s cooked in a slow-cooker. The stew is made up of onions, sweet potatoes, kale, cherry tomatoes, cubed beef, broth, a little bit of curry paste, and a little bit of peanut butter. Do not let the peanut butter deter you. This is not a peanut butter stew. The peanut butter, when cooked for several hours in a slow-cooker, enhances the flavor of the broth and adds a subtle peanut flavor. The curry paste adds just a little bit of complexity to warm the stew up. The stew is everything you want a beef stew to be: well bodied, hearty, comforting, and delicious. Hope you enjoy this stew as much as I do. Happy fall! Side note: Slow-cookers are a must-have kitchen appliance for anyone with a busy schedule who enjoys home cooked meals when they arrive home after a busy day. Slow-cookers are awesome. Cleaning slow-cookers is not so awesome, which is why I think many people do not like using them. Cleaning them sometimes requires soaking in soapy water for hours. This is why I’m super happy to partner with Reynolds and introduce to you their Reynolds Slow Cooker liners that make cleaning up after slow-cooking a breeze. You basically use a liner every time you use your slow-cooker and after you’re done you lift the liner up and out and throw it away. No cooked on foods in your slow-cooker. 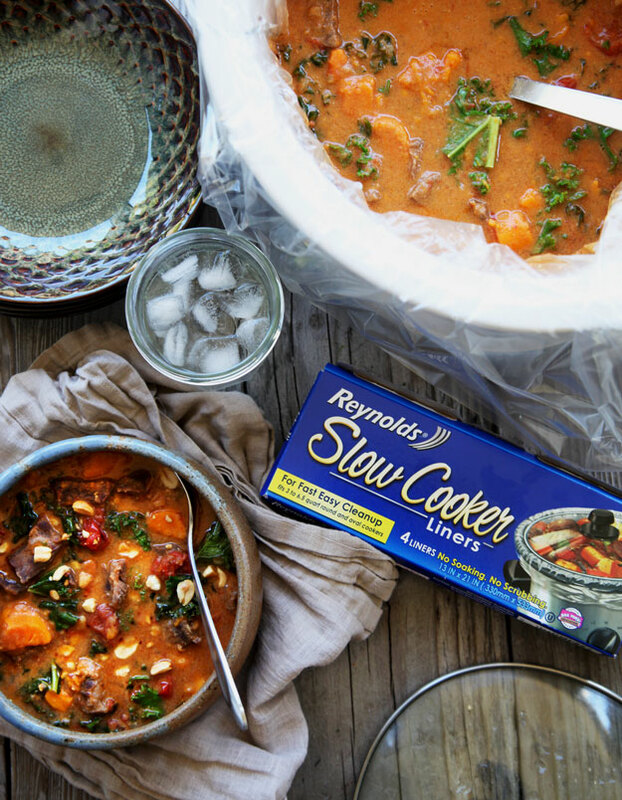 If having to clean your slow-cooker has kept you from cooking with it then Reynolds Slow Cooker Liners is the solution you never knew you needed but totally do! A hearty beef stew recipe with a hint of peanut and curry flavor. 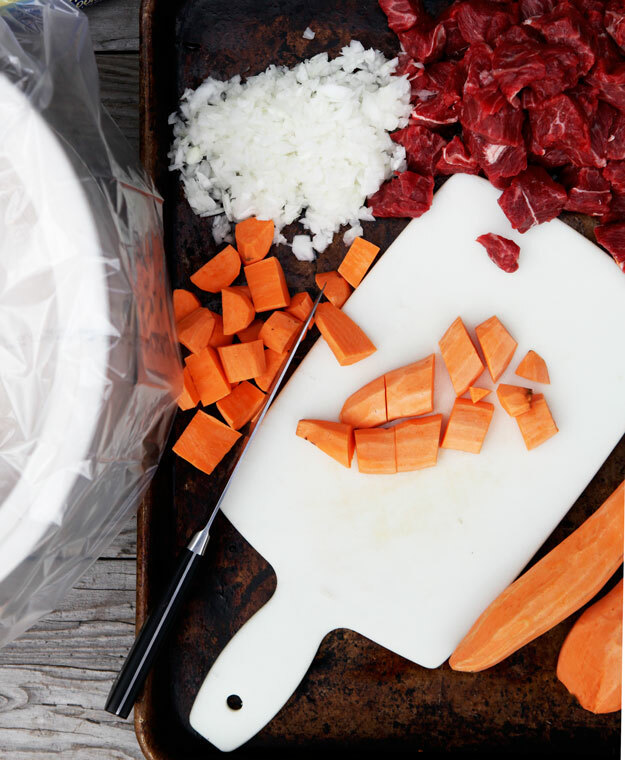 Add the beef, sweet potatoes, onions, tomatoes, and garlic to a slow cooker lined with a Reynolds Slow Cooker Liner. In a large bowl or blender, mix both broths, peanut butter, and curry paste. Taste the broth and season with additional salt if needed. Pour the broth over the ingredients in the slow cooker. 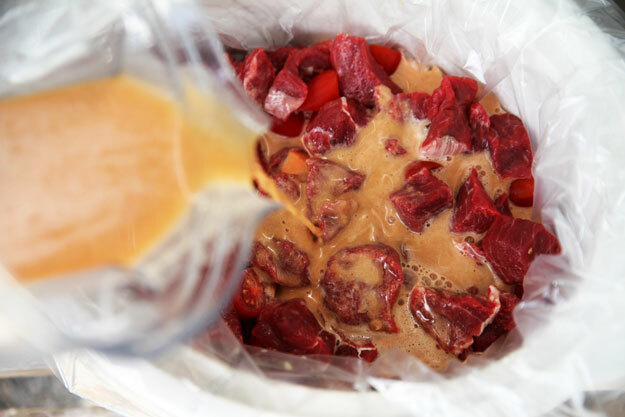 Place the lid on the slow cooker and cook for 5 hours on high or 8 hours on low. minutes before the cooking time has ended, add in the kale. Optional garnish: Add a spoonful of chopped roasted peanuts to every bowl. Disclosure: Reynolds and Savory Sweet Life have partnered together for this sponsored post. 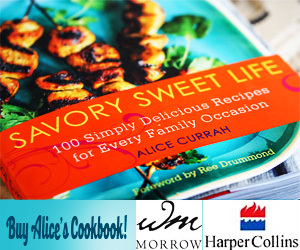 This was a no-brainer for Alice because Alice does not like to wash dishes, especially slow-cookers. I made this over the weekend for a dinner party and everybody was raving. It was truly amazing. I have never loved a beef stew this much! I was looking forward to leftovers, but alas, there were none (and I made a lot!). So great. Thanks for stopping by. I would never have imagined that peanuts and beef could work together so well! Oh yum! I’ve made this with chicken, but need to try your beef version! What a lovely blend of flavors! I can’t wait to try it. so glad I found this recipe, this looks wonderful, especially with the peanut butter, I get it! Also love that this has one of my favorites, sweet potato! Thank you for this recipe! I’ve been looking for slow cooker recipes and came across this one, very interesting flavors!, thanks for this recipe!